Building a rich and full vocabulary provides the foundation for excellent reading and expression of one’s own ideas. One way to build that rich vocabulary is through studying Greek and Latin. At this time, the study of the roots of these two languages was my goal for a few of my students instead of the full languages. Greek Morphemes Lessons (It’s NOT Greek to Me!) from Ready to Teach has become a part of my son’s daily work. When our package arrived it contained the Instructor’s Manual with a PowerPoint CD and a Student Book. 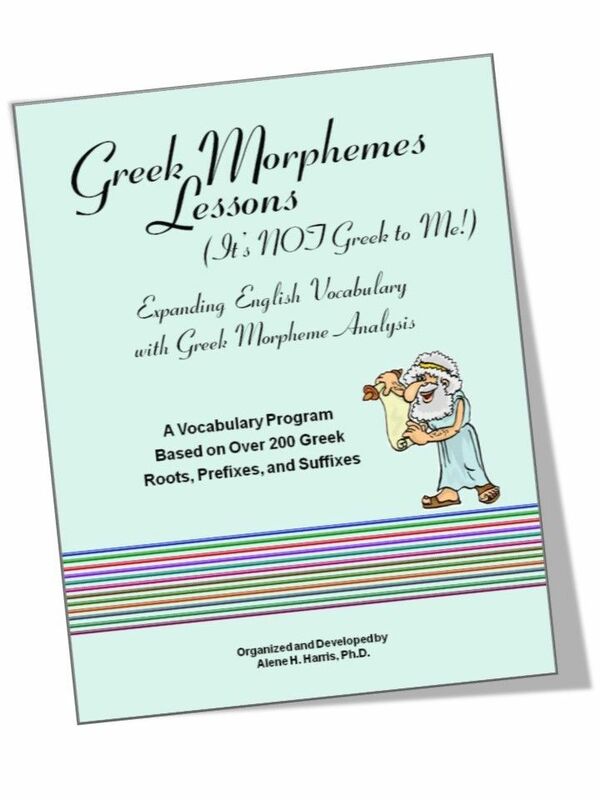 The Greek Morphemes book covers over 200 morphemes (roots, prefixes, and suffixes) in twelve lessons. At first glance, I thought the program might take a bit more time than I was expecting in implementing it. After a brief read through, I realized I was mistaken. 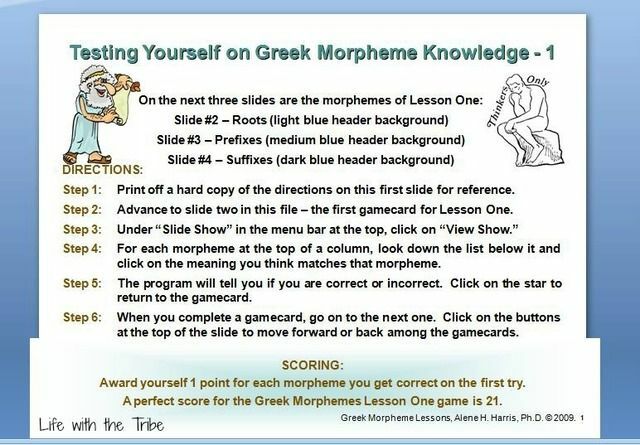 Greek Morphemes is very easy to begin using; it is almost an open and go resource. The Instructor’s Manual contains the lessons and answers keys, transparency masters, tests and answer keys and pre-made study cards. The method of doing the lessons is explained and what each activity the student will work through is explained. After this the instructor’s manual is basically answer keys and tests. Since I was using this with only one student, we had no need for the transparency masters. The pre-made study cards are printed on colored cardstock paper for durability. The PowerPoint files are broken down by lessons. The student simple uses the slides marked for the lesson he is on. Previous morphemes used may be reviewed and then new morphemes are introduced. The PowerPoint files also include self-reviews for the lessons. It is basically a chart with the morpheme at the top with possible meanings below it. The student clicks on the correct meanings. If it is incorrect, the program will let him know and the student re-tries. A very simple, no frills review that is quick and effective. After defining the words, the student tackles context clues by using the words in sentences to show their meanings. The creativity continues when the student is asked to create two new words using the Greek morphemes they have learned. The next assignment gives the students words that need to be broken apart and defined. Words such as polyheterodemologist or diademoscope might be on the list. No problem, right? Then a simple matching quiz tells the student if they were correct on the word break down. At the back of the student book, colored paper to use for making study cards is provided. The paper is normal weight copy paper so the cards will not hold up long term but should be sufficient for use over twelve lessons. **Special Note: We also received a flash drive containing the PowerPoint files. Previously the program came with a CD but Ready to Teach will begin to use flash drives instead. This better serves the teachers and students as many computers no longer utilize a CD/DVD player. We used both over the past few weeks. Greek Morphemes is being used by my son who is thirteen. After looking over the material, I decided that this would be perfect for independent study. The lessons naturally fall into a weekly set up. Each Monday he begins a new lesson by watching the appropriate PowerPoint files and then tackles Assignment A. He works through an assignment a day until he is done and then he takes the test. The assignment on Context Clues where he had to write sentences was a bit daunting at first. However, he simply watched the slides again, I helped him work through a couple of words, and then he progressed with no issues. Other than checking his work, I haven’t been needed much at all. I was surprised at how well my son took to Greek Morphemes. When it arrived he was not exactly excited. However, once he got started, I have rarely had to remind him to work on it. I asked what his thoughts were on this program and he said, “I love it! It’s fun, easy, and I get to make up my own words. I would rate it ten stars out of a possible five stars.” Folks, he really enjoys this resource! And it is working. It isn’t just because it is fun or easy. He is constantly making up new words and using them. Words like microbibliophobia (fear of small books) or phonomanicphobia (a fear of a madness for sound). I always look forward to what he is going to come up with and we all get a good laugh. All laughing aside, he is building a great foundation for a full, rich vocabulary. Interested? You can work through a sample lesson. Ready to Teach also has a Latin Morphemes course as well. After a great experience with Greek Morphemes, I think we will definitely move on to Latin next. This entry was posted in Homeschool, Reviews, The School Table and tagged computer, curriculum, Homeschool, language, review by sweetie. Bookmark the permalink.